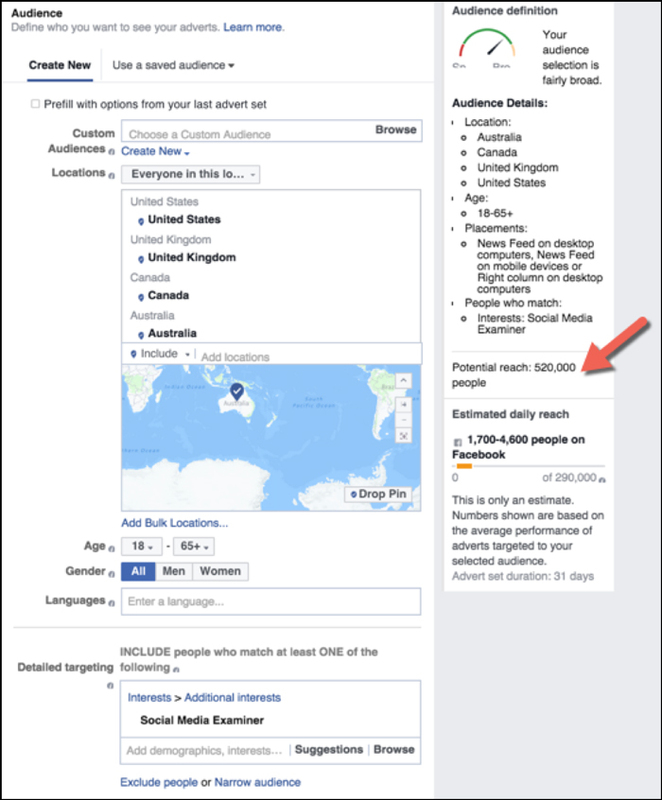 There’s no better way to promote your local business than using Facebook ads. Your customers can help promote your business to their family and friends on Facebook, and we all know how effective word of mouth is. 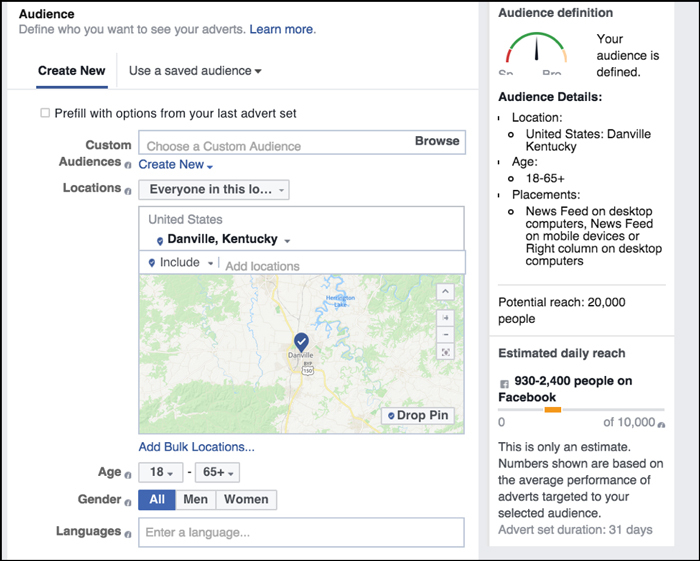 Better still — running Facebook ads for a local business is also fairly easy. Much easier than if you were attempting to advertise to an international market. Because local businesses know exactly how to target their audience, while the rest of us are left to wonder…. Where are these people hiding!? Local businesses know something really specific and crucial about their target market: they live or are in close vicinity to their business. Instead of having to wrack your brain for different interests to target, the targeting is done for you. You know that they live in or are visiting your city. For example, at DigitalMarketer we sell our products in 70+ countries. 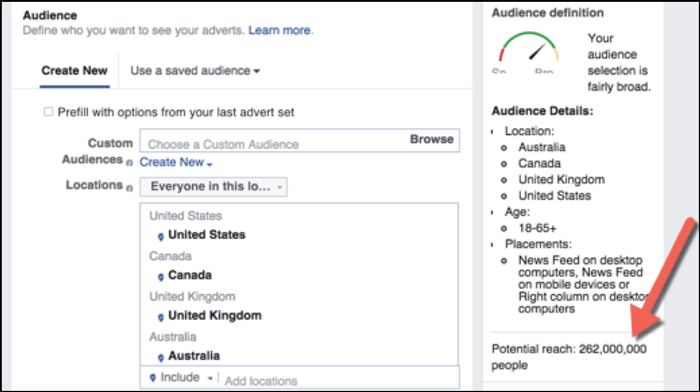 So, when I’m creating Facebook campaigns, even if I only select the four top countries that we do business in, I’m faced with the dilemma of having to narrow down the audience size because 262 million is WAY too large. So, I add interests that would appeal to business owners and people interested in marketing. 520,000 is much more reasonable and will generate an audience of people that are actually interested in what we re selling. For local businesses, the targeting is done for you! 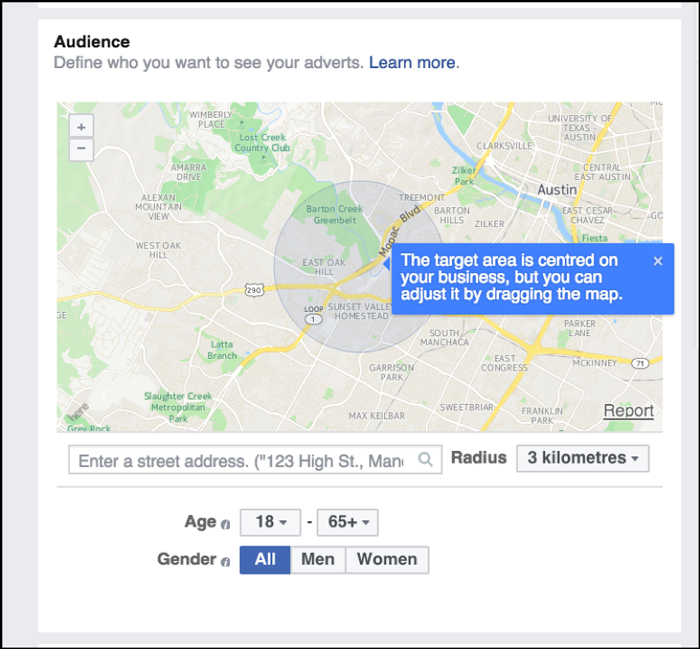 The audience is nice and defined, no targeting needed other than the location. 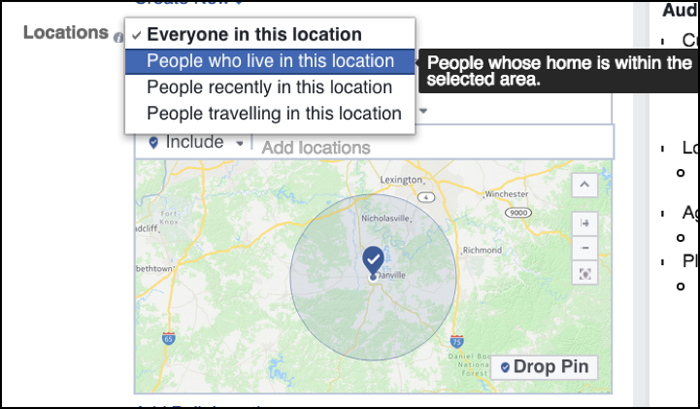 You can also specify whether you want to reach everyone that is in this location, people who actually LIVE in this location (based off of what they specified on their FB profile), people recently in this location, and people traveling in this location. These will come in handy based off of the type of local business you own. If you own a restaurant, you would want to target everyone, but maybe create specific campaigns that give visitors or residents specific discounts. If you own a dental clinic, you’d want to go after people who actually have roots in the city. If you’re scrolling through your newsfeed, you’re most likely to stop and read something that’s written specifically for you. You’re much more likely to notice an ad that has the name of the city where you live within the copy. The ad seems more relevant to you. 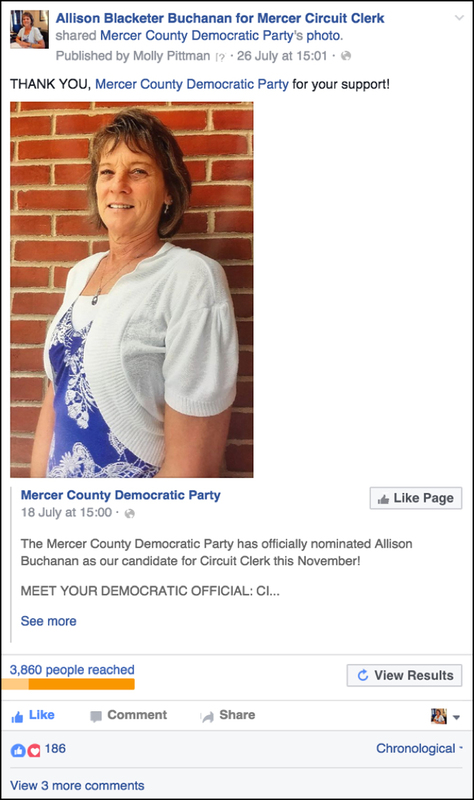 When you’re running ads to a local market, use the name of the city in your ad! 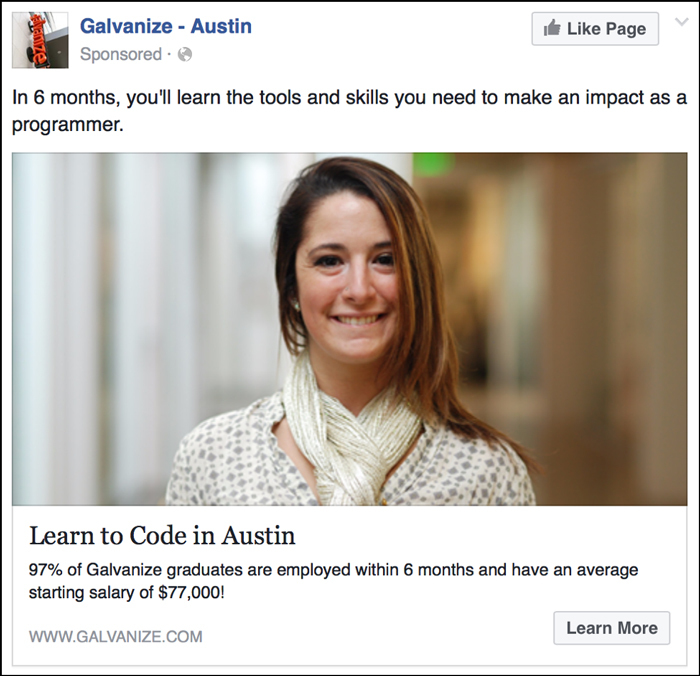 In the ad above, Galvanize says “Learn to Code in Austin”. Not just “Learn to Code”. They’re specifically talking to people that live in Austin. 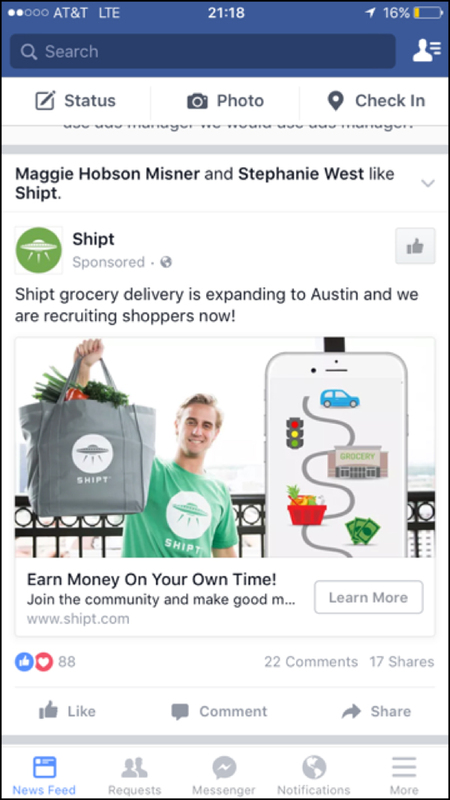 Above, Shipt says that they are expanding to Austin, not just that they are expanding. 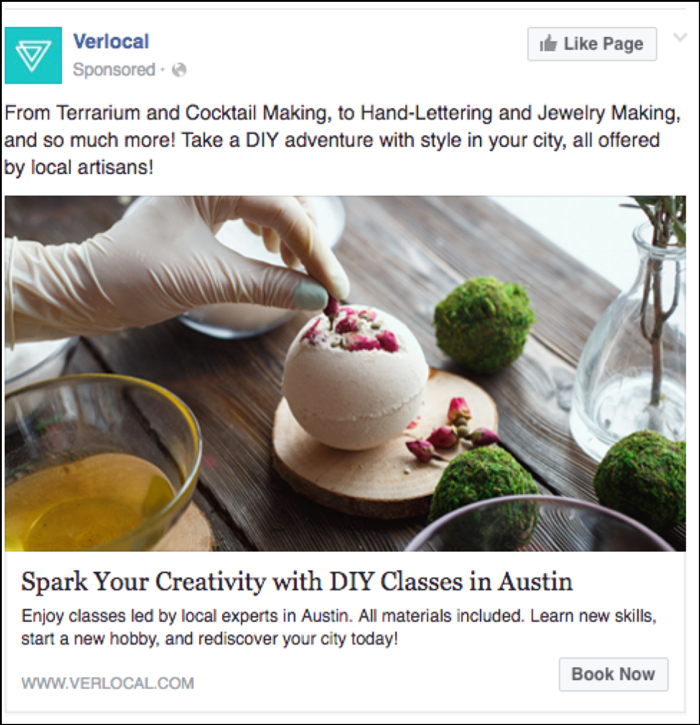 Verlocal says to “Spark Your Creativity with DIY Classes in Austin”. Similar to the Galvenize example, they’re doing an awesome job of catching people’s attention because the classes are actually IN Austin, this isn’t a random ad that should be ignored…. 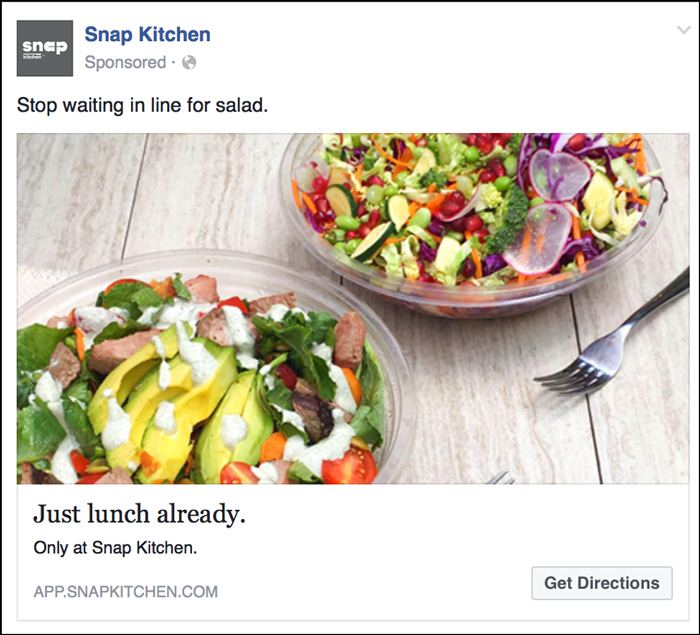 Imagine how much more effective the below ad would be if it said “Austinites — stop waiting in line for salad!”. Morale of the story: use the name of your city in your ad. It adds specificity and will catch your target market’s attention. 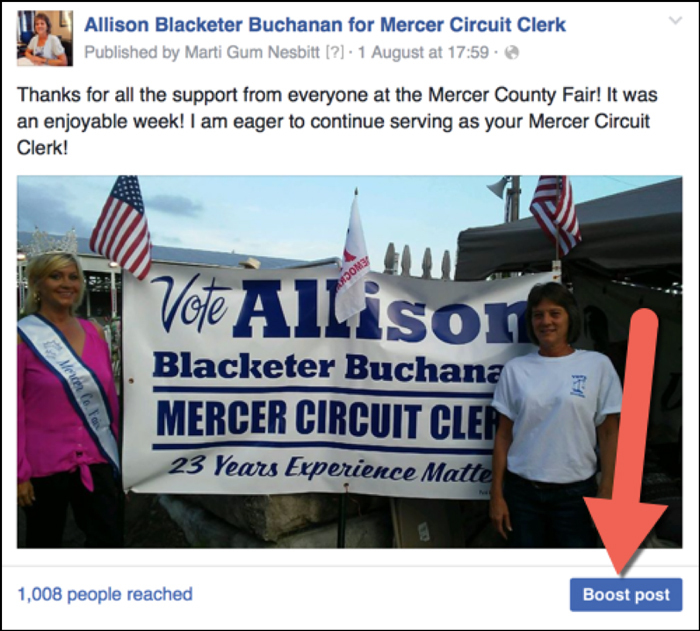 Do you post status updates to a Facebook page for your business? …below the post to show the post to more people. You can boost a post for as little as $3. 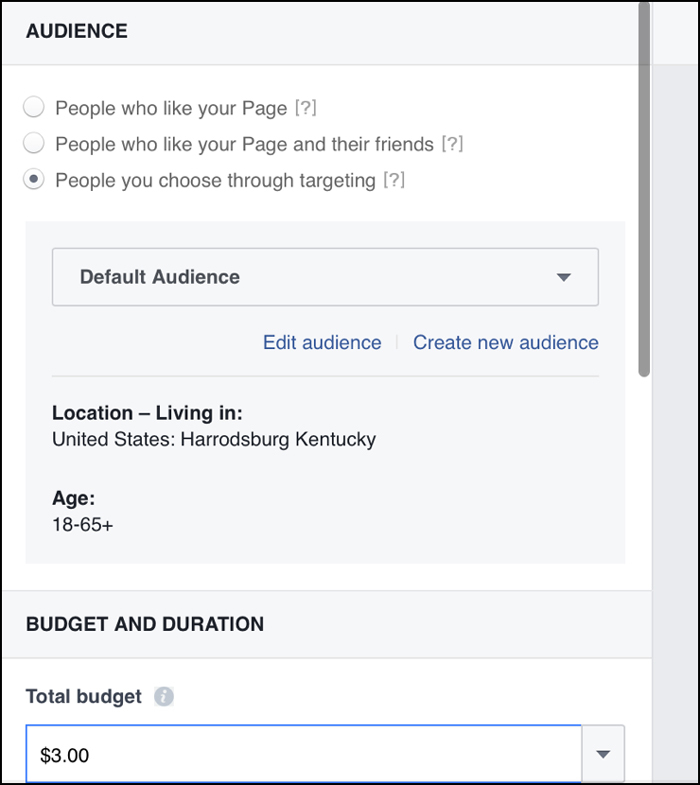 Specify that you want choose people through targeting and enter the name of your city. Boost anything that would be interesting to your audience!! Justine’s is one of my favorite restaurants and as soon as I saw this ad it immediately made me want to visit, so I invited one of my friends and made a reservation. THIS STUFF WORKS! Post something interesting on your Facebook page and give it a boost to see how the community reacts. 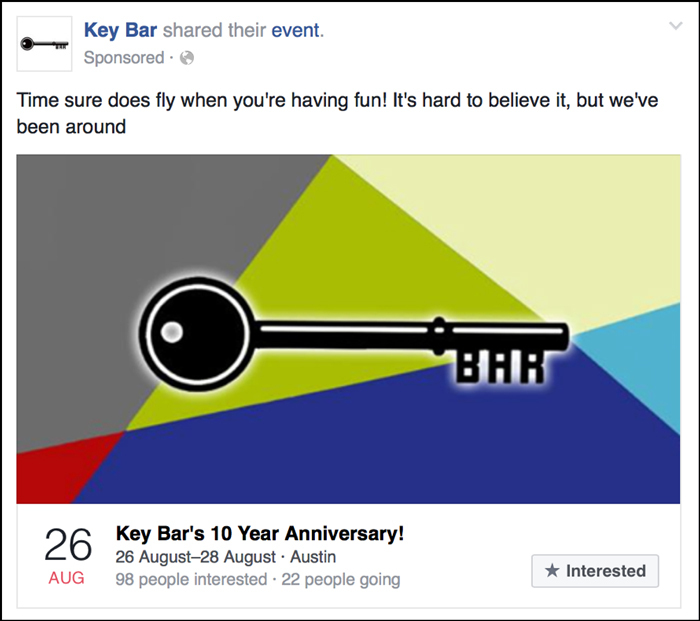 Creating and running ads to a Facebook event is great way to get people to visit your establishment. If you’re a car dealership, have a Sunday family festival on your lot. Offer free food and face painting. This will get people in the door and the next time they go to buy a car, I bet they come to your lot. If you’re a salon, hold special events to teach people hairstyles. The best part about events is that once people start to mark that they are interested or going, it will show in their friends’ newsfeeds. 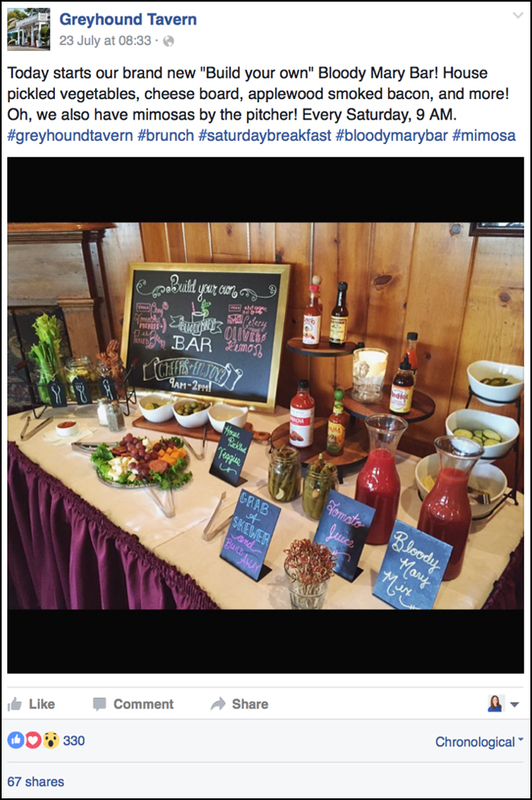 … events are GREAT for word of mouth. When holding an event, give people a reason to attend! Offer discounts or free food and giveaways, create a theme, make it a party! A great way to catch a local market’s attention is to run a free promotion or discount. If you’re a bar or restaurant, promote your happy hour discounts. 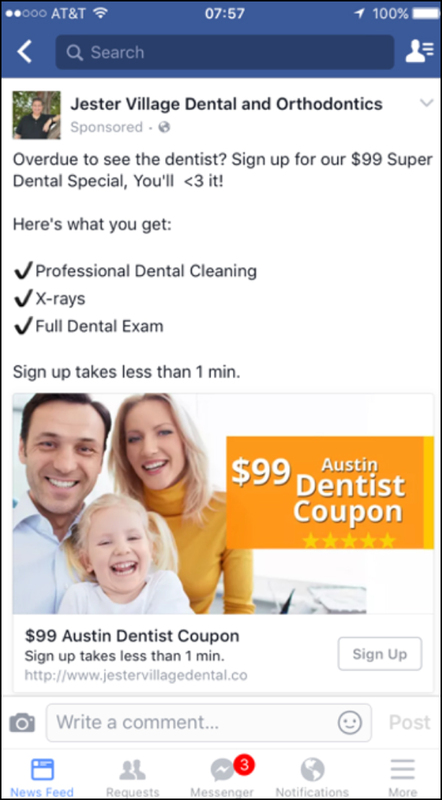 People who are in the need for a dentist will absolutely respond to the above ad because it’s positioned as a promotion. Even if you break even to get them in the chair, there is a chance that they will become a lifetime customer. What are you willing to give away for free or at a discount in order to acquire a customer? Creating pieces of content that appeal to your local market is ALWAYS a great way to catch their attention. 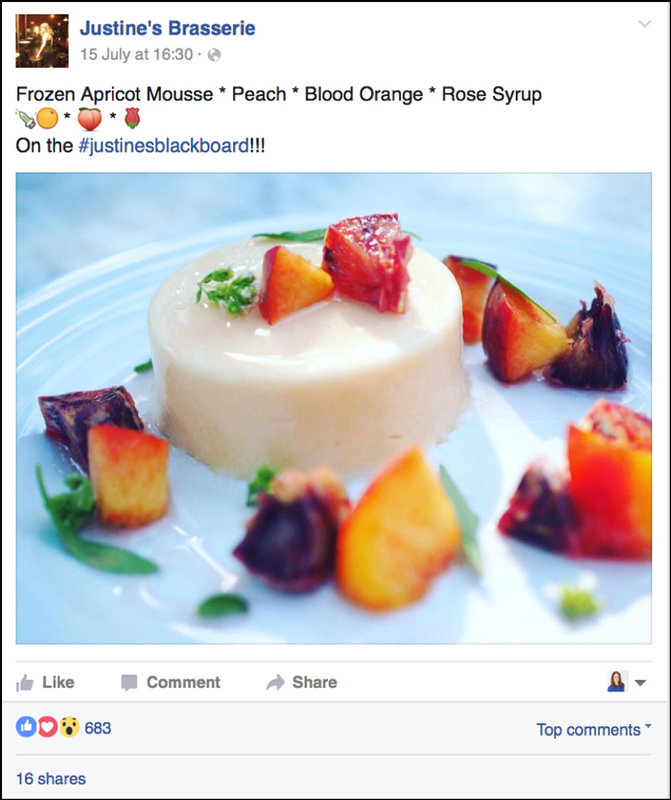 Content can be written, on a blog, or even in the form of video as a Facebook video ad. Running ads to content is great for markets like real estate where building rapport is important. Instead of ads that ask people if they’re ready to buy or sell a house (most people don’t have that specific need at this time), they’re simply giving content. 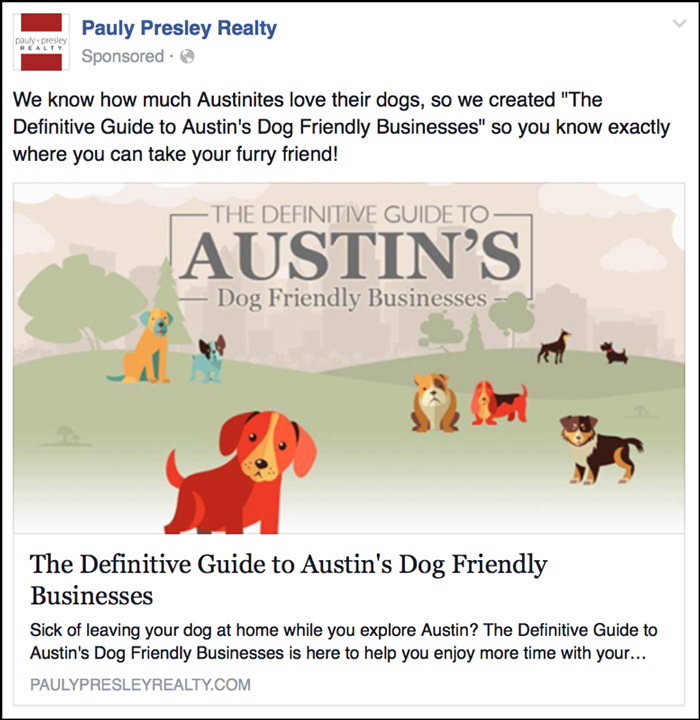 “The Definitive Guide to Austin’s Dog Friendly Businesses”. If you own a gym or are a personal trainer, you could promote a piece of content that educates people on the best outdoor places to exercise in the city. If you’re a restaurant you could make a list of the best happy hour’s in town (and happy to include your own) :). 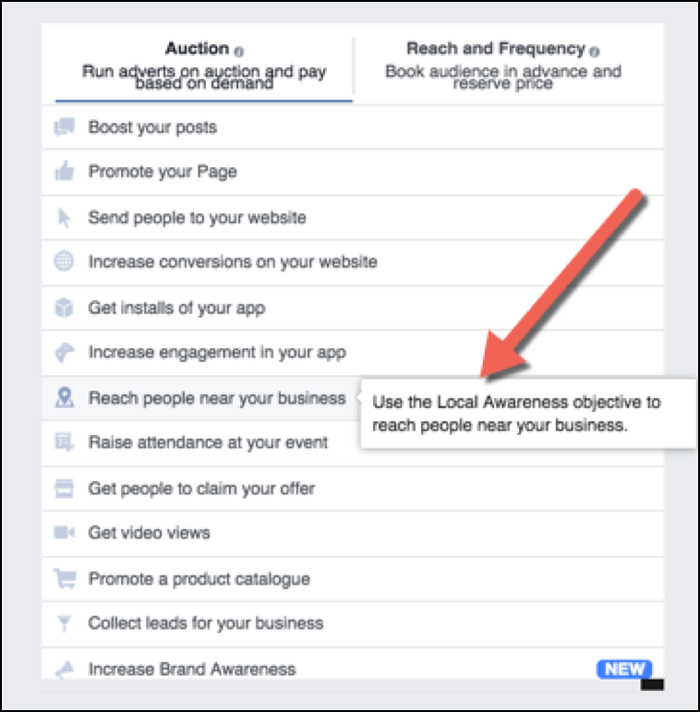 As you can see, the possibilities are endless for local businesses to leverage Facebook advertising. When going to create your first campaign, or to boost your first post, focus on how you will stand out in the newsfeed. Are you using the name of the city in the post? Are you giving them a reason to take action now (a discount)? Are you giving value first with content? Excited to see your success!